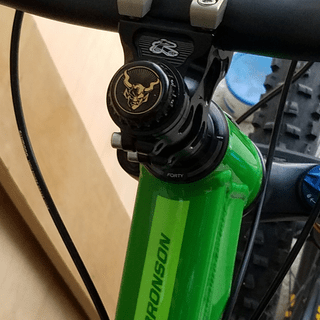 This nifty alloy top cap exclusively from Niner replaces your existing top cap, so that you can snap your favorite beer (or any other bottle cap beverage) bottle cap over the built-in lip to customize your ride. Makes for a great conversation piece out on the trail or in town! Installation is not permanent, so you can switch out different caps as you see fit. 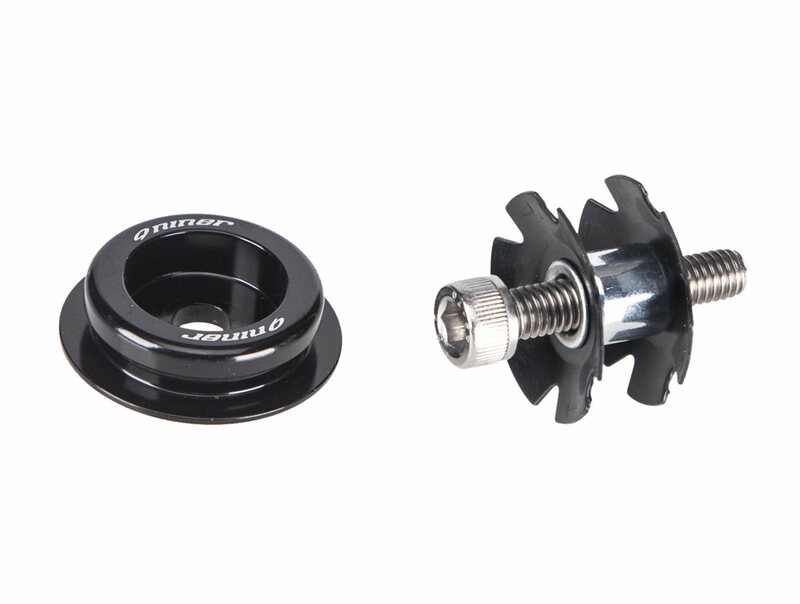 Compatible with any 1-1/8" steerer. Show off your favorite brewdog! Make all your friends wonder if it's time to get you into A.A. Installation was a breeze, and the beer I drank whilst installing was delicious! Nothing worse when on a long singlespeed ride and having to stare down at an ugly silver bolt with a rust mark in the center. With the yawyd cap, you have a solid top cap with a Guinness bottle cap to motivate you to finish the ride quicker. 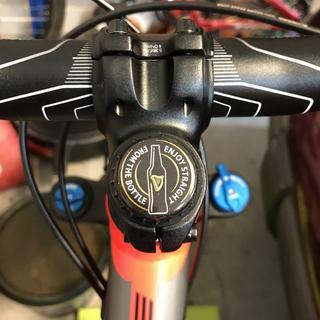 Then you can enjoy A Guinness and use the new bottle cap for another bike. My goal every time I pop open a Guinness is to attempt to keep the cap as flat as possible to make the perfect top cap decoration. Cool product, helps make your ride more personal and a definite conversation starter! Installation, less then 60 seconds to take off my factory top cap and install this top cap. about 2 seconds to snap on my bottle top. Nice, fun top cap that lets you add some cool factor to your bike. The finishing touch to your ride. This is a great way to personalize you bike plus it looks awesome. What a great idea! probably one of my favorite mods on my bike. my favorite beer is always with me! Awesome add-on to personalize your bike. What a fun way to customize your ride and express your mood or indidualism!!! This thing is so cool. I will be buying one for every bike that I have. What a great idea this was from Niner. Great may to make your bike unique to you and your personality. Love this top cover. Neat seeing my favourite drink bottle cap right there in front of me when I ride. this is a cool add on. you can change it out to whatever, I've got lucky buddha on my side. wish niner would make bottle bar end caps to match. This is a cool product for just adding another level of customization to your ride. I have one on my MTB and road bike. I get all sorts of comments on group rides. Not much to say here. It does its job. You can pop on caps easily and get them off as well. Still functions perfectly as a top cap and is light weight. I get lots of comments from my beer caps while out racing gravel. Look no further, this is a great 'bling' accessory to add to any bike! This was one of the best "bling" additions to my bike. Although not a necessary component, it keeps you focused on the prize at the end of the ride... a nice cold one. And is a great conversation piece. Nice addition for a great Jenson price. Beer, it's not just for breakfast! You're nearing the end of a long ride. You feel trashed! Then you look down at the bottle cap of your favorite brew, and are able to sprint home to down one. This awesome top cap came installed on my RIP9. I really dig being able to change it depending on what my favorite brew is. Makes an excellent gift for any avid cyclist that also enjoys a beer or two. Christmas is coming up! Stocking stuffer!!! Very stylish and quick delivery. everyone should have one of these.Just buy one and youll love it.The only downside is that youll be drinking more beers to get different caps....but wait...thats an upside! oh and your camelbak will be jingling from carrying an assortment of spare caps....but thats ok too..
Jensonusa has not let me down yet. Jenson USA is always lightning fast with shipping, which is why I shop almost exclusively with them! Easy to install and gives your bike a little extra bling. Simple installation and easy way to personalize your bike! I have one of these on every bike. I love the looks and it's something a bit different to spice up your cockpit area a bit. Switching bottle caps is a breeze and I get alot of comments on the trail. I like Bikes and Beer so what better component to put on my bike.... Easy install. Coolest bling for your bike! Love swapping caps on all my rides. I have these on almost all of my bikes. This is one of my favorite purchaces. It lets other people see your fovorite beer or soda and sparks up many conversations between other riders. Niner did it right!! I bought this last spring and when I showed up at trail everybody wanted one!! After the ride they all went to our LBS and cleaned them out. It's a conversation starter for sure and looks really cool. The cap stay on even if you take a header or case a jump. Great Xmas gift for you riding buddies. Gotta have em on all your bikes! Put one of these on your stem and snap on your favorite IPA bottle cap to give you incentive for a big climb. Every Single Speed or Fat Bike on the planet needs one! This allowed me to attach a bottle cap to my bike while adding weight at the same time! It is really cool though, for real. These caps are fun. Very simple and easy to install. Love being able to display my favorite current brew!. Such a great idea. Also helped quiet a squeaky head tube on my Specialized which has a weird angled top tube. This is straight and quieted it down! Great topcap for adding a little personality to your ride. Bikes go well with beer, and beer with bikes. Cool way to show off what you drink, great conversation starter at the trailhead, hehe. 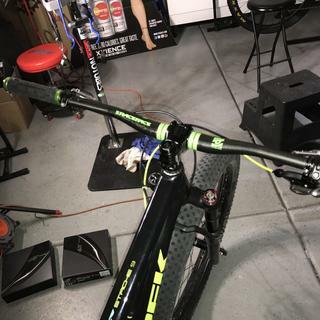 Adds a great custom look to my MTB. While riding it reminds me of the cold beer that will follow the ride. A wonderfully inexpensive way to a your personal touch to your ride.